Chicago Est.1837: ALBUM - @DeezyDaPaperboy is "The Midwest Miracle". ALBUM - @DeezyDaPaperboy is "The Midwest Miracle". 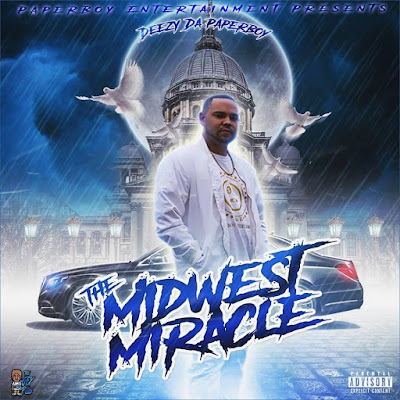 Creating timeless music, putting on amazing live shows, and providing a platform for other artists to shine are only part of what makes Deezy Da Paperboy "The Midwest Miracle." Making the transition from full time recording artist to executive is a move not everyone is equipped for. Deezy not only made the move, but has excelled in his new position. Da Paperboy has become a known commodity in the world of Midwest Hip Hop with his brand of high energy, potent rhymes and his affinity for banging beats. His latest release The Midwest Miracle serves as a reminder that even in his new position as a label head, music is the number 1 priority. Keeping it short and sweet with only 5 tracks, the energy remains high with singles like "Trap" and "Blessed Up". "Quick Notes" serves as a road map through the thought process of the talented emcee and "Light The Sky" featuring Alexa Redd showcases both his songwriting ability and the talent that brought Alexa into the Paperboy Entertainment fold. With plans to tour in the first quarter of 2019 and new singles and releases planned for the rest of 2019 it's only a matter of time before one the Midwest's best delivers yet another miracle.